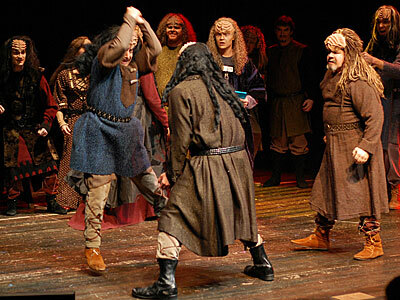 A scene from Commedia Beauregard's production of "A Klingon Christmas Carol"
Sometimes I have to be in the business of creating culture, not just re-creating culture (or ‘re-presenting culture’ as I sometimes refer to my musical activities). I’ve been watching a DVD of the final performance of “A Klingon Christmas Carol” which is a production by the Commedia Beauregard that has been running during the Christmas season for the past four years. This is in preparation for scoring incidental music that my group, il Troubadore (or more properly, the il Troubadore Klingon Music Project), will be recording for the live production this season. As I’ve been developing Klingon Music and the possible theory behind it for the past year or so (though my interest in Klingon music dates back many more years as I’ve mentioned elsewhere) sometimes projects like this are incredibly satisfying. Nothing like creating not only original music, but a completely ‘original’ style of music for a culture from a Science Fiction series. While I won’t be posting actual examples that will be used for the score/soundtrack of this production, I will continue to blog about (with other examples) the music as I spend more and more time immersing myself in Klingon Culture. As I mentioned in a previous status update at my facebook page that I still haven’t gotten the typical post conference/event blues after having the chance to play a concert with Yo-Yo Ma–this project and the project in my previous post are the reasons (amongst so many others). Or, as the Klingons would say, Hoch ‘ebmey tIjon (“Capture all opportunities!”)! Next Whither the Louisville Orchestra?